Happy February! There's still some hope for us for the current monsoon event... Euro and UKMET showing interest later next week, GFS a little less bullish. For people in Herbert and Lower Burdekin, Central Coast and Whitsundays and parts of Peninsula, Gulf Country, North Tropical Coast and Tablelands, Northern Goldfields and Upper Flinders, North West, Central Highlands and Coalfields and Central West Forecast Districts. Issued at 11:04 am Sunday, 3 February 2019. DAMAGING GUSTS AND INTENSE RAINFALL WITH SIGNIFICANT FLASH FLOODING EXPECTED BETWEEN INGHAM TO BOWEN, SLOWLY EXTENDING SOUTH. Threat for heavy rainfall and damaging winds remains elsewhere. Weather Situation: A slow-moving monsoon trough lies across north Queensland, extending from Townsville to Gregory Springs and into central parts of the Northern Territory. It is forecast to shift slowly south over the next day or two to be near Bowen to Hughenden and into the Gulf Country. A deep, semi-stationary tropical low is also embedded along the monsoon trough, currently located about 200km north-northeast of Mt Isa. The monsoon flow is expected to continue intensifying for the remainder of today resulting in widespread severe weather. 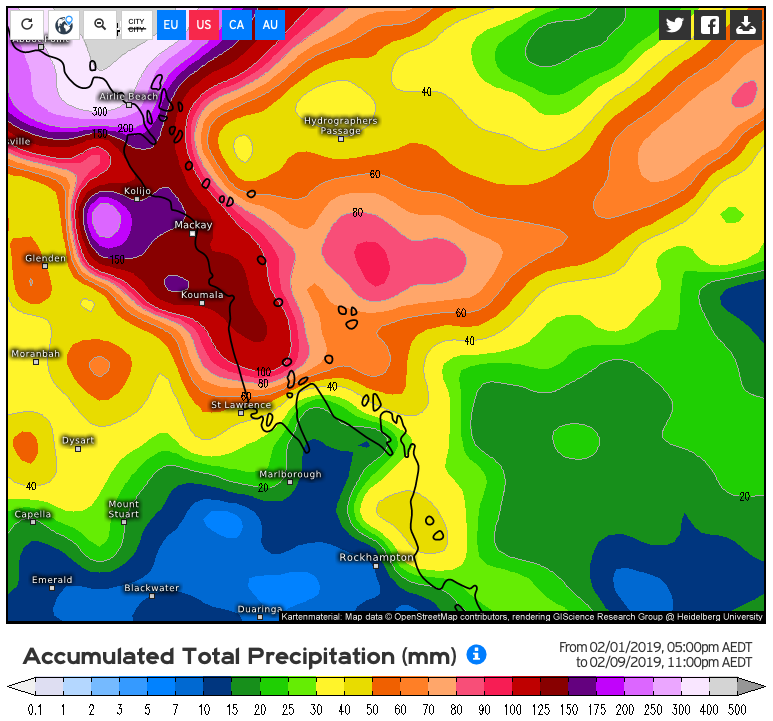 The monsoon trough is expected to remain active this week, with further heavy rainfall expected for already saturated catchments. The potential for significant and dangerous flash flooding will likely continue for areas between Ingham and Bowen, extending as far south as Mackay from Monday. 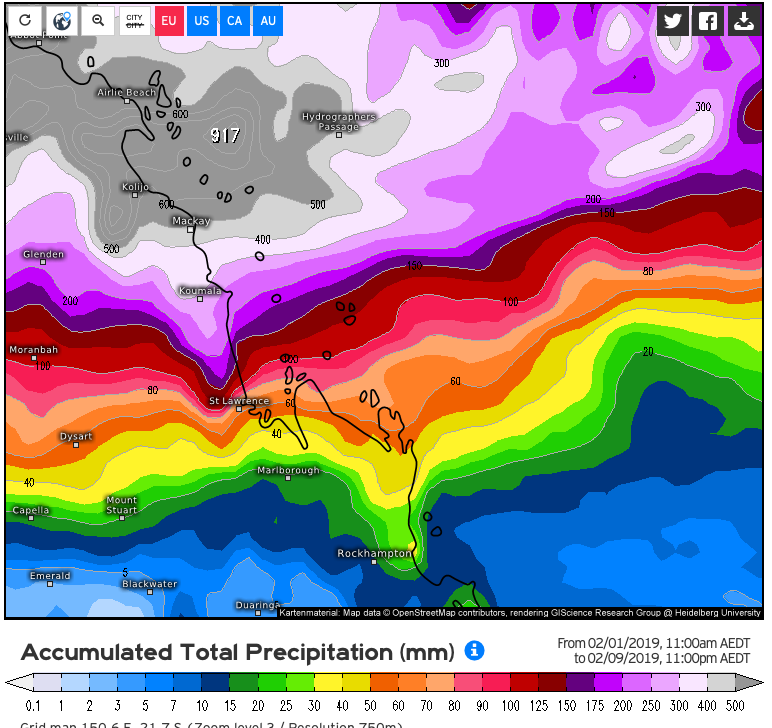 Over the next 24 to 30 hours, heavy rainfall with six-hourly rainfall totals between 150mm to 200mm are likely with concentrated areas of intense rainfall with totals up to 300mm possible, particularly with bands of thunderstorms. Creek and river catchments are already saturated and will therefore respond very rapidly to any rainfall. Flash flooding is a high risk. Landslides have been reported associated with this event and will continue to be possible in vulnerable areas that have experienced significant rainfall. Damaging wind gusts up to 100km/h are also possible about the coast and ranges, potentially locally destructive in excess of 125km/h in thunderstorms. 92km/h wind gust was recorded at Lucinda at 9pm AEST. Ingham Pump Station 506mm, Halifax 416mm Gairloch 414mm, Cardwell Gap 309mm Mount Margaret 232mm, South Townsville 226mm and Mount Bradley 154mm. Over the next 24 to 30 hours, heavy rainfall, which may lead to localised flash flooding, is expected over parts of the Gulf Country (south of Pormpuraaw), North West, Central West and Northern Goldfields and Upper Flinders districts. Six-hourly rainfall totals of 70 to 120mm are possible. Damaging wind gusts up to 100km/h are also possible to the south of the monsoon trough and tropical low. Monsoonal squalls with gusts up to 90km/h may also develop north of Pormpuraaw, particularly with thunderstorms. Gereta Station 232mm, Julius Dam 204mm, Gunpowder 145mm, Miranda Creek 138mm, Dugald River 128mm and Cloncurry 106mm. For people in Herbert and Lower Burdekin, Central Coast and Whitsundays and parts of Gulf Country, North Tropical Coast and Tablelands, Northern Goldfields and Upper Flinders, North West, Central Highlands and Coalfields and Central West Forecast Districts. Issued at 4:54 am Monday, 4 February 2019. 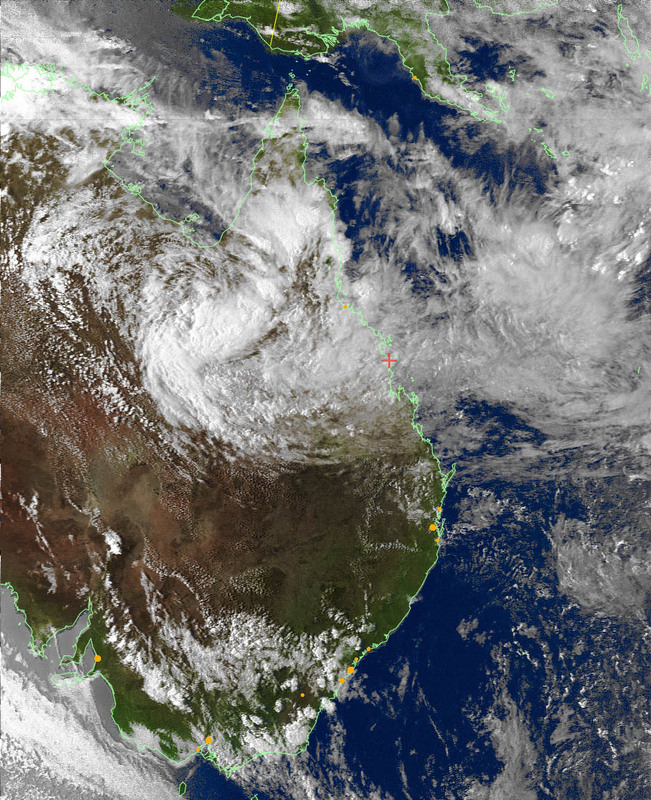 Weather Situation: A vigorous, slow-moving monsoon trough lies across north Queensland. It currently extends from Ingham to Gregory Springs and into a deep, semi-stationary tropical low, situated about 200 kilometres north of Mount Isa. The monsoon trough may remain slow moving or drift shift slowly south over the next day or two. It will remain active this week, with further heavy and intense rainfall expected for already saturated catchments. The potential for SIGNIFICANT and DANGEROUS FLASH FLOODING will continue for areas between Ingham and Bowen, possibly extending as far south as Mackay during today or tomorrow. For the remainder of today, further heavy rainfall with six-hourly rainfall totals between 150mm to 200mm are likely. Concentrated areas of intense rainfall with totals up to 300mm possible, particularly with bands of thunderstorms. Creek and river catchments are already saturated and will therefore respond extremely rapidly to any rainfall. Landslides have been reported with this event and will continue to be possible in vulnerable areas that have experienced significant rainfall. Damaging wind gusts up to 100km/h are also possible about the coast and ranges. Locally destructive winds in excess of 125km/h may occur with thunderstorms, however this threat is more likely to be confined to coastal areas. Locations which may be affected include TOWNSVILLE, INGHAM, BOWEN, AYR, PALM ISLAND, GIRU, ROLLINGSTONE, PROSERPINE, WHITSUNDAY ISLANDS AND MACKAY. For the remainder of today, heavy rainfall, which may lead to localised flash flooding, is expected over parts of the northwestern interior (west of Julia Creek) and eastern interior (east of Gregory Springs) of the state. 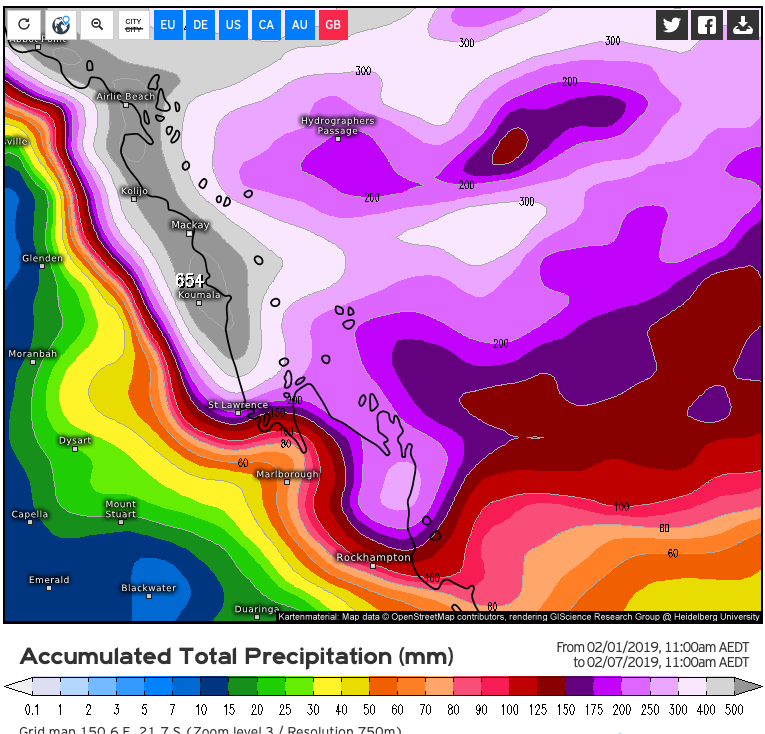 Six-hourly rainfall totals of 70mm to 120mm are possible. Damaging wind gusts up to 90km/h are also possible to the south of the monsoon trough and tropical low. Not sure I want it lol. An image using legacy satellite technology. NOAA 19 at about 0700UT, APT 137.100MHz, MSA / IR composite, VK5EME kit receiver, 3el crossed yagi / dish thingy. Red + is Mackay = me. Lear jet.. can u get a shot of Keely,ies Rd under water? It just may happen again..
110 mm since 9 am today,hammering down. looks like its our turn.. If it floods I'll get some photos Batty. Nice Pic Lear Jet! Looks like you will be staying put for a while Batty. 72mm since 9am here looks like a lot more to come. Yes Hagrid,my low rider geko ute cant handle anything above 300 at main causeway. Have not been out under my own steam at all so far this year. After last nights rain falls it could easily be another week yet. Strewth that a lot Batty. Only 50mm here at Andergrove. 91km/hr wind gusts at Hamilton Island at 7.25pm tonight. Bloody windy on the mountain at the moment! Gusting over 40knts.. thats a guess. No idea of the speed as my weather station has dropped its bundle and is saying -18c out side. 157mm since 7am. From the nylex. Crazy here 173 mm to this morning and another 100 to now. Everyone living in the gorge has been stuck in , or out for 6 days now. 7 registered (mysteriousbrad, Farra, Dr Philosophy, gleno71, Rhys., gberg, 1 invisible), 54 Guests and 2 Spiders online.